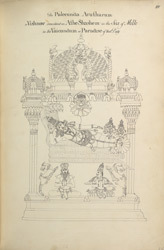 Pen and ink drawing that depicts Vishnu Anantashayana reclining on the cosmic serpent Ananta, from an 'Album of 51 drawings (57 folios) of buildings, sculpture and paintings in the temple and choultry of Tirumala Nayyak at Madura. c.1801-05', by an anonymous artist working in the South India/Madurai style, c. 1801-1805. Each picture is inscribed with a title and a number in ink. This drawing is of a carving that can be found in the Minakshi Sundareshvara Temple of Madurai, the sacred complex built under the patronage of the Nayaka ruler Tirumala in the 17th century. Within the large enclosure are two temples dedicated to Shiva as Sundareshvara with his consort Minakshi, and several mandapas (halls) with elaborately sculpted columns of the gods from the Hindu pantheon. Vishnu is one of the three main gods of the Hindu Trinity (Trimurti) who acts as the preserver of universal order. He is often associated with creation myths and in this drawing he is represented as Anantashayana reclining on the coils of the serpent Ananta or Shesha, whose hood with many heads curls up above him to provide a protective covering. A lotus blossoms grows from his navel on which Brahma sits, who then creates the universe.